Summer may be over, but this pup is savvy enough to know that autumn is really where it's at. Stella the Lab is pretty stoked at the opportunity to play with her tennis ball - because it means she gets to jump into a delightful pile of leaves! Thanks to her trusty sniffer, Stella has no trouble finding her beloved ball beneath the leaf-stack. Swimming in leaves maaay be even more fun than swimming in water. Certainly more practical for the changing seasons. Easily the most entertaining aspect of Stella's romp is her periscope-like tail sticking out of the leaves, wagging happily as she roots around for her tennis ball. A most successful days of leaf-jumping, indeed! Stella gained considerable internet notoriety earlier this summer for her unusual "stopping style," where she would slide to a stop whenever she wanted to lay down. According to her owner Jody Hartman on the original YouTube video, "Stella is a perfectly healthy yellow lab, and she only does this to cool down on the grass after she's been fetching and playing. She has been tested for EIC, and has no medical issues at all." 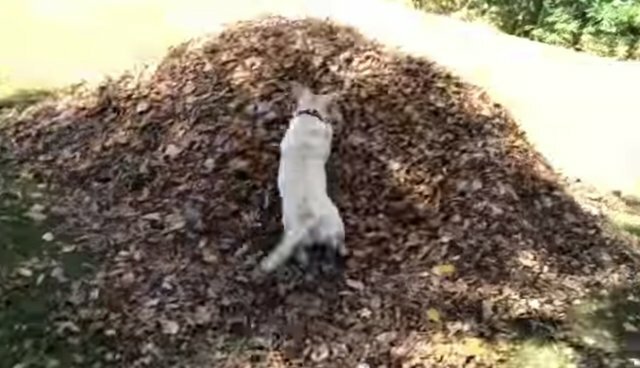 Does your pet love playing in leaf piles too? Then your photos could be featured on The Dodo! Send in the best pic of your pet enjoying the leaves to submissions@thedodo.com.